Preparatory works on Birmingham’s £450 million Paradise Circus project will get under way shortly following award of a £30 million contract to Carillion, the start of a project that will transform the Paradise Circus area of the City. The development is being undertaken by a joint venture of Birmingham City Council and Hermes Real Estate, with Argent as development manager. Hundreds of construction jobs will be secured over what will be a long development process carried out in three phases. The overall project will involve ten new buildings providing 1.8 million sq ft of offices, shops, and a four star hotel. There will also be a range of cultural and leisure facilities including a concert hall. Carillion will start on its contract to provide enabling works and infrastructure for the first phase by autumn this year. The project will include demolishing the City’s old Central Library, with new works coming on three phases. The first phase, to be completed by 2018, will involve two buildings along with related public realm and road works. 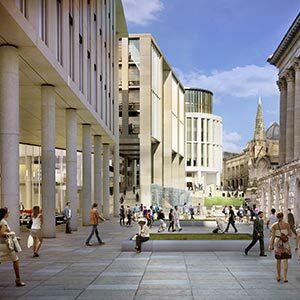 The development, which will rejuvenate a 17-acre area between Centenary Square and Chamberlain Square, has been hailed as transformational for Birmingham City Centre. The first contract award on the scheme comes soon after news of progress on the City’s long delayed £500 million Arena Central Development, which was taken as a sign that development activity in the regions is on an upward path.